I hope this newsletter finds you well as I say a very heartfelt, "Woo hoo!!" The City Council approved our contract with Union Bank this week so we can finally, finally, finally start opening the Neighborhood Council checking accounts. It has been one heck of a journey this past year, and I was compelled to do a happy dance in Council Chambers when the unanimous vote went through on Tuesday. As soon as we execute the final signatures on the contracts, we'll be opening accounts next week. Thanks again for all of your patience, and I promise you that it will be worth the long wait once you start using your accounts. This great week started on Sunday for me as I stopped by Westside Neighborhood Council's Pick Pico, a packed event showcasing the businesses on Pico Boulevard. The place was bustling and I enjoyed watching Board member and event planner extraordinaire, Lisa Morocco, duet a song about Pico Boulevard with Councilmember Koretz. 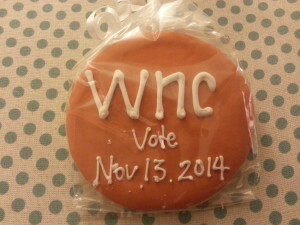 President Terri Tippit was passing out my new favorite outreach tool, a yummy cookie, to over 500 folks for their November selection. They also have a pretty neat outreach video on their website, too. I then hopped over to SORO Neighborhood Council's SoRo Community Festival where I again bumped into the hardworking Councilmember Koretz, but just missed their LAFD Jaws of Life demonstration. This was again a great community outreach event for the whole family. I'm just so impressed with the caliber of work our awesome Neighborhood Councils do, and I wish I could get around to everything, such as Porter Ranch Neighborhood Council's recent Education Town Hall. It drew a beyond capacity crowd on equity with education funding. The Board of Neighborhood Commissioners met on Tuesday and the hot topic was the training policy dealing with harassment and bullying. There are 2 versions with one (Training Policy) giving the Neighborhood Councils the ability to deal with such issues via a removal process and the other (Draft Harassment and Bullying Policy) giving the Department the authority instead given the liability issues in resolving such matters. The Commissioners will be talking about these proposals at the various alliance meetings across the City this month, but if you'd like to weigh in on the matter, please email Janet.Lindo@lacity.org your comments, and Janet will forward them to the Commissioners. I have to recognize and appreciate our Field team: Melvin Canas, Lisette Covarrubias, Taneda Larios, Amber Meshack, Thomas Soong, and their supervisors, Leyla Campos and Joe Hari, for stepping up these past months and doing over 60 board orientation trainings one-on-one with Neighborhood Councils so they can start off with a solid foundation. If your Neighborhood Council hasn't yet scheduled this training, please do so your board and stakeholders can learn together what it takes to be an effective Neighborhood Council. I'm wrapping up this week as great as it started with a stop by North Hollywood North East's full house for our terrific Outreach Bootcamp last night, with entertaining more international visitors from Kazakhstan, Tajikistan and Kyrgyz today who were impressed (as usual) with our awesome Neighborhood Council system and with a stop by the LANCC tomorrow for their monthly meeting. If I don't see you around this weekend, have a relaxing one! The Bet is On Between Mayor Garcetti and Mayor de Blasio! Mayor Garcetti Announces First 15 "Great Streets"